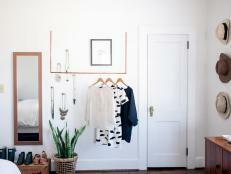 Your closet can look like this one, organized by Heidi Goodwin. Read on to see how. You opened the closet door one day, a pile of sweaters fell on your head and you snapped. In a fit of organizational pique, you purged your unworn dress shirts, untangled that knot of belts and paired up all your shoes. Unfortunately, that was the easy part. Now how do you put the stuff back in so you don't end up with the same mess? We've brought you four great closets to guide you through the process: two existing closets overhauled by professional organizers and two dream closets created by interior designers for maximum usability and organization. Plus, get the look in your own closet with eco-friendly tips and our suggestions for comparable closet organizers. 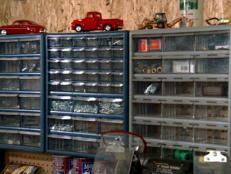 Clear, labled containers keep this crafter's supplies in order. The Challenge: The homeowner makes and sells craft items, and she often brings fabrics home to be pressed and hung. She is also a travel buff who creates a lot of photo albums. 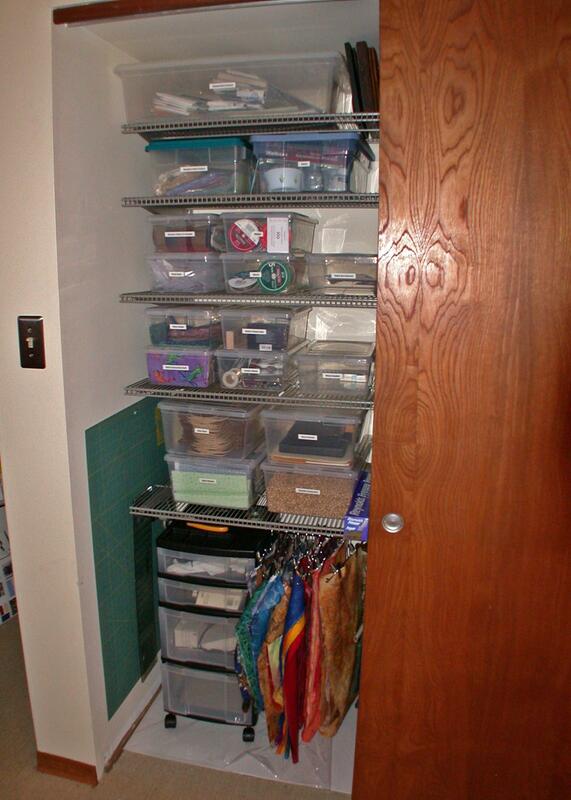 Her craft materials were stored haphazardly all over the room, however, and the closet was hardly used. "That's actually pretty common," says Kerry Crocker, a professional organizer. "It's because most closets, when you move in, don't serve any one purpose very well, not until you put in your own hardware and containers." The Solution: Kerry made the closet amenable to all the crafting activities by sorting similar items into groups and placing them in clear, labeled containers. "Nothing ever goes back in the wrong place when the container is labeled," Kerry says. 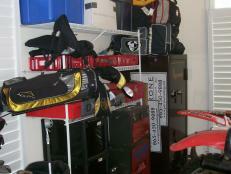 Finished items, which need to be accessed less often, were placed on top shelves. "Nothing is ever stacked more than two containers high," Kerry says. "You can pull one out with one hand and grab the one on the bottom with the other hand. You never have to set one thing down to get to something else. That's important." Get the Products: Wire shelving can be found at almost any home-improvement store, but you're not limited to white. "Aesthetics were pretty important to this homeowner," Kerry says, "so she went with nickel-colored shelving that's a little bit higher-end." 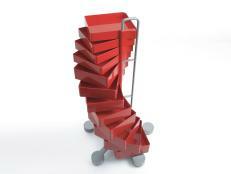 Kerry likes modular shelving that can be reconfigured over time. "It's a common mistake that people make," she says, "to forget their needs may change in the future." 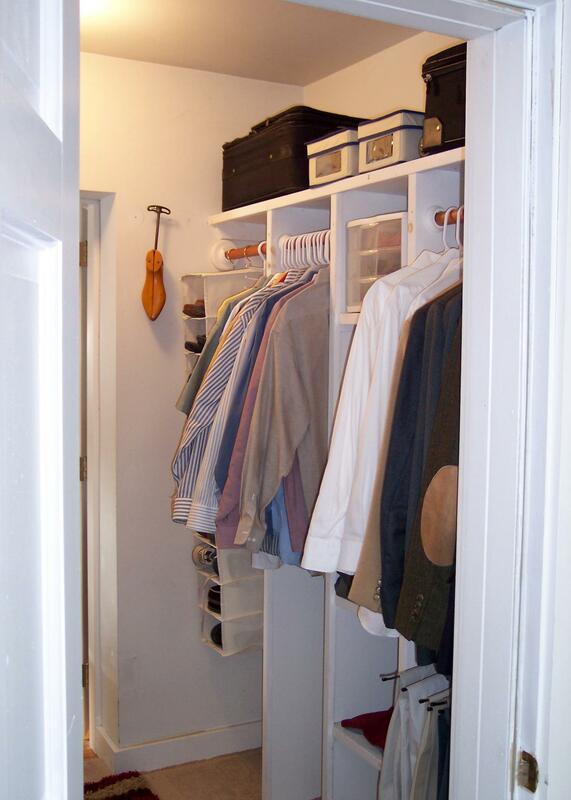 Try This at Home: The four-drawer container at the bottom of the closet is on casters. Each drawer has dividers to keep items for different activities separate, but the entire container can be wheeled to the area of activity. Cleanup is simple; just roll it back in the closet and shut the door. How Green Is My Closet? Although new plastic containers are not particularly good for the environment, Kerry reused containers the client already had, a very eco-friendly move. "Visually, it might be more chaotic, but you can even reuse shoeboxes, wine crates or baskets as containers," she says. Storing items by frequency of use helps get this master closet organized. The Solution: Patience in this case paid off. After a good deal of searching for closet accessories at local home-improvement stores and online at sites like Organize.com and The Container Store, Heidi found a set of canvas baskets at Lowe's that did the trick for the odd-sized cubbyholes. Get the Products: Boxes with clear fronts lent the closet a streamlined look while still allowing the contents to be viewed. Hanging shoe racks freed up floor space to ensure a neat, clean feel, and Heidi replaced all mismatched hangers with identical plastic ones to unify the look. 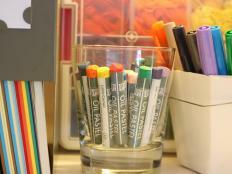 Try This at Home: Organize items by frequency of use. Anything you use once or twice a year (for this client, it was certain pairs of shoes) goes at the very top of the closet. Eye-level space should be reserved for everyday items. How Green Is My Closet? The canvas baskets Heidi used are made of natural fibers, which lend warmth to the space and don't emit as many volatile organic compounds (VOCs) as synthetic fabrics or plastics. Look for minimally processed natural fabrics, such as 100 percent organic cotton, that haven't been treated with caustic dyes or bleach. Keeping one shelf empty makes this closet feel even bigger. The Challenge: She wanted the sleek, sophisticated look of high-end Poliform closets but discovered they come in predetermined sizes only and don't allow for customization without a hefty surcharge. The Solution: Interior designer Nicole Sassaman had cabinets custom made of solid walnut that mimicked certain elements of the Poliform closets she loved. "I did custom handles to keep that linear look that I like," she says, "and then I even had custom hangers made to hang on a square rod to keep that cool, simple look. It's those little details that really make a difference." Clear-glass drawer fronts ensure she keeps the contents sorted and tidy. Get the Products: Beautiful boxes from West Elm line the uppermost shelves. "In those boxes is where I keep the baby's old clothes, old files I can't throw away; it's storage for the whole house," Nicole says. "It's so high up, I don't need to get to it very often." The contents may be miscellaneous, but the look is polished and uniform. 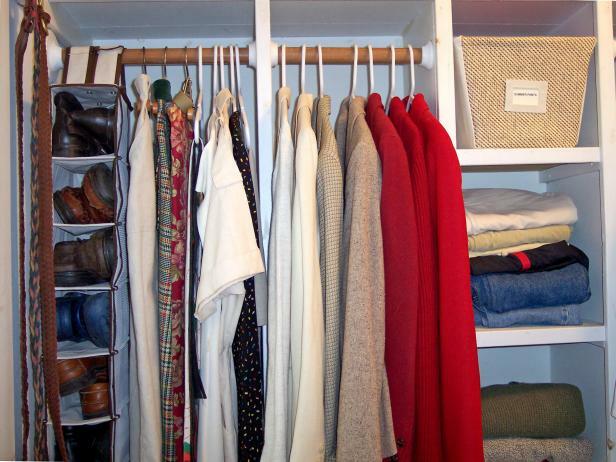 Try This at Home: To preserve a feeling of abundant space in your closet, don't fill every shelf. In Nicole's closet, a second-tier shelf that surrounds the room remains empty. "If I'm filling that whole closet, I've got organization issues," she says. "I keep that shelf totally blank because it looks better." How Green Is My Closet? "I always try to make sure the lumber we use is eco-friendly," Nicole says. "All the wood shown here is from managed forests." 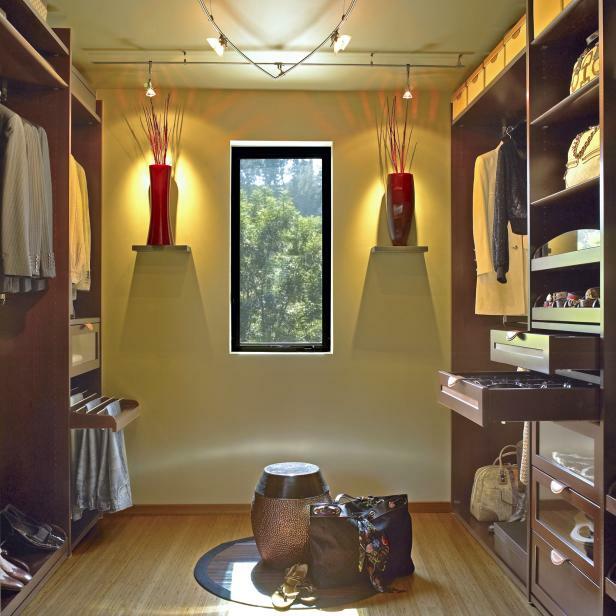 This closet was designed with the environment in mind. 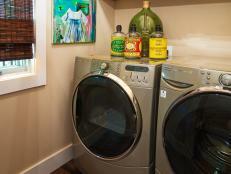 The Challenge: The homeowners wanted a closet that emphasized green principles above all else. Interior desigern Lisa Adams's task was to maximize the limited space available for a his-and-hers closet while staying true to an earth-friendly philosophy. The Solution: "I wanted to create a wardrobe that was a living space and not just a place to house clothing items," Lisa says. "All of the details, while environmentally conscious, make you want to stay in the space rather than grabbing your clothing and going somewhere else." Lisa created a soothing effect with Asian elements: shoji sliding doors, asymmetrical basalt shelves with vases and a fish-shaped lighting feature. Get the Products: For tiptop closet organization, Lisa included the usual suspects, such as drawers with jewelry/lingerie inserts, pull-out shoe shelves and some not-so-usual items, such as a copper drum that doubles as a stool and a storage bench. Try This at Home: A pants press, like the one Adams installed for this homeowner, can restore creases to trousers, reducing the need for professional dry cleaning. How Green Is My Closet? This closet pulled out all the stops in terms of environment-friendly materials: formaldehyde-free bamboo flooring for low emissions, low-voltage lighting to save energy, low-VOC paint to reduce air pollution and beech cabinets produced in Germany, which has strict standards for sustainably managed forests. 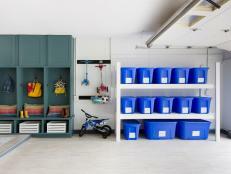 See how a garage filled with bikes and clutter is transformed into a stylish and organized space. Get smart with storage. 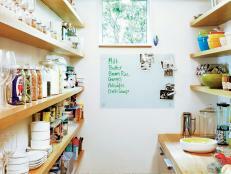 16 pantry ideas to get your kitchen in order. 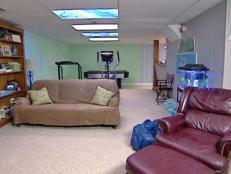 Hosts Amy Devers and Karl Champley offer tips on how you can easily turn an ordinary basement into a fun family hangout. Spring cleaning is so last season. We're more ready for a fall overhaul.